Making a change to the processes your business has been using since its inception can seem like a daunting task, but that’s precisely what Blue Wren faced back in June 2016. However, the switch went a little deeper than merely altering a chain-of-command or implementing a new piece of software; it sought to alter our entire methodology. When did you first hear of Scrum? PH: Lancaster Uni, from Ian Somerville and his Software Engineering course, circa 17 years ago. The Scrum framework is born from software engineering. DM: My course had specific modules regarding agile methodologies with emphasis on Scrum. ML: My wife bought me Scrum: The Art of Doing Twice the Work in Half the Time by founder Jeff Sutherland for my birthday. I started reading it on holiday and was hooked. SD: When Michael and Phil gave me the Scrum book and said, read that! So, why did you make the switch? ML: The approach made so much sense. SD: After reading only the first few chapters I bought into the idea straight away and started implementing it. I wasn’t happy with how the process was at the time and thought this is a much better way. DM: On software, we wanted to improve the delivery speed of projects. SQ: We needed better collaboration. Scrum allowed everyone involved to get their ideas across, and stopped people from sitting on the information that other people might find helpful. PH: We thought about how it can be used for more than just software engineering and how the collaborative, transparent, and rapidly iterative nature can lend itself to any project that requires tight control through iterative process. ML: Scrum forced a discipline of full engagement and transparency between all team members and the client, every day. It gave ownership of the project to each individual and enabled us to respond to any issues instantly, minimising any disruption to the project. What was it that appealed? ML: The original appeal was the concept of Daily Scrums where we would understand the health of every project in the business, as well as the roles of Scrum Master and Product Owner – these helped to clarify clear responsibilities within the team. EL: For me, it was the organisation and structure. It’s good to have full visibility of all ongoing projects, and it helps to see what other people are working on to avoid blockages. DM: Plus, it’s tried and tested. It enhances communication and opens the ability to share ideas. SD: I love the team work and the idea that we are all equal and take responsibility for the project. Everything is transparent. PH: Yeah, transparency, accountability for the team, the team winning or no-one winning… The perpetual knowledge that you amass across projects from meeting every day is invaluable. SQ: There’s improved transparency amongst the project group and with the client. In theory, it gives them exact deadlines and better estimates, which makes them happier – which makes us happier. PH: It was a culture shock. SD: Not all people adapted to change instantly. Some people took longer than others to accept the new way. PH: It’s still an unusual fit into common business practices. Defining a Story needs to encompass the complete deliverable from the customer’s perspective and needs a clearer definition of what ‘Done’ looks like. DM: Ensuring that the stand ups were regular and weren’t neglected was an issue. Also, making sure that stand ups were concise and not a free for all discussion was a challenge. SQ: It was difficult to implement pure Scrum with Digital Marketing; it’s more of a natural fit with software, but it seems to have settled after adapting certain aspects. ML: In an agency context, some of the aspects of Scrum don’t quite work as there is no clear ‘end’. We had to therefore adjust our definition of what a Sprint, an Epic and a Release looked like. We also struggled with the scoring system, it was difficult to not use ‘time’ as the measure when scoring stories. EL: People from different departments didn’t fully comprehend the length of time certain Digital Marketing tasks took – where a task might have seemed small to them, it was actually bigger to us. So, it was initially difficult to score the tasks… or a least to get everyone to agree! But we are much better at communicating these now, thanks to Scrum. Would you recommend it to another company? PH: Any company that needs rapid incremental progress updates, across multiple projects or clients, should definitely use Scrum. SD: Yes; particularly for any company that needs multiple resources. Scrum would work well, getting them all working together. EL: Yes, it makes projects a lot easier to see. ML: Definitely. I’ve recommended it on several occasions. I have also given presentations on how we have applied it to our business and the benefits and challenges it has delivered. I’d be happy to speak to anyone who is considering applying it to their business. 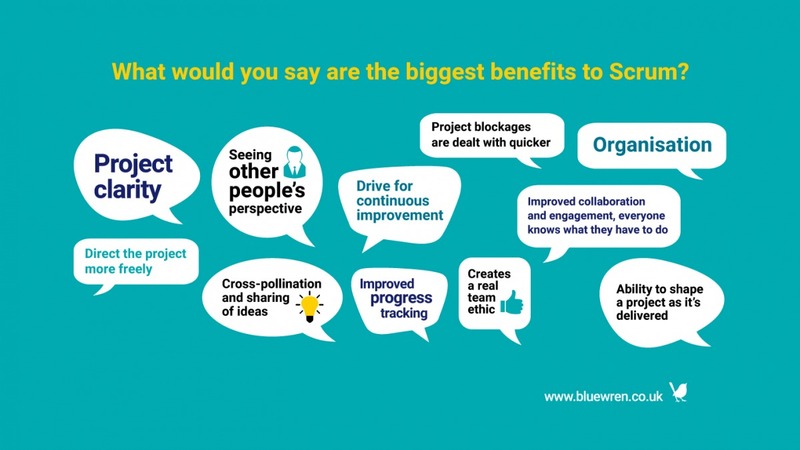 What would you say are the biggest benefits to Scrum? EL: Clarity; organisation; tracking progress each week; continued improvement… It lets people see another perspective of other people’s roles in the company. PH: The collaboration creates a real team ethic. The fact you see progress quickly and direct the project more freely are hugely beneficial. DM: That enhanced communication improves the ability to share ideas. SQ: And the cross-pollination of ideas means that blockages in the Sprint are dealt with quicker. ML: The improved collaboration and the level of engagement between all staff working on the project means that there’s this ability to shape a project as it is delivered, giving a much better final result. Also, at the heart of Scrum is the drive for continuous improvement. SD: The team working together means everything is out in the open, everyone knows what they have to do. Working part-time, I feel comfortable leaving for the day knowing all my team are capable of running the projects. DM: Not specifically, although it does need constant tweaking to ensure that the process remains true to the lean principles. SD: If you’re working with freelancers, they aren’t here to talk to in daily Scrums so project flow can sometimes come to a standstill and miscommunication can happen. PH: Gaining client acceptance of Scrum can be initially hard. It’s completely the opposite of Waterfall project management and the usual, “tell me how much and by when” approach. ML: Clients, quite rightly, want to know full specification, delivery schedule and budget. The Scrum approach requires the client to trust us to work with them to shape the project as it is being delivered. This results in a much better end result but can be hard to sign off on without seeing the traditional ‘Gantt chart’, and that’s never accurate! PH: It’s difficult to get clients to buy in to the Sprint Release cycle, but once they do, the benefits are soon apparent. We then have an onus to stick to deadlines and adjust project deliverables accordingly, although it would be easy to fall back on the Scrum “can’t give a finish date yet” mentality. Do you find it easier than before? EL: Much easier. You discuss what got in the way and what we can be improved in the project from the client’s perspective. SD: Yes, the process has been refined over time and we’ve slowly introduced more aspects of Scrum as we’ve gotten better at it. ML: It’s much easier. But more importantly, it is a far more enjoyable and effective way of working. What’s the impact on productivity? DM: It’s definitely improved overall. ML: And continues to do so. PH: When we focus on clearly defined Stories and definition of Done, productivity increases hugely. The reverse is true for when we are too vague with Stories, or when we make them too granular and they become Chores. SQ: The team’s productivity has increased a lot. Scrum stops you from multi-tasking, which I found was slowing me down. SD: Yes, also websites are turning around much quicker than before, and clients are much happier. What have you noticed in terms of improvements? EL: There’s more clarity, it’s more organised and there are more realistic time goals and targets to achieve. I also like the retrospective sessions to see if there were any blockages. DM: It’s much better in terms of cross-skilling and communication. PH: There’s a better visibility of project health and where a project is at, at a given moment. Knowledge across all projects has increased. ML: There are much better levels of engagement and understanding of the project across the business, meaning that if one of the team is struggling, for whatever reason, others can easily step in and assist. SD: Everyone knows if there is a red area approaching and all are on hand to tackle it. SQ: It’s easier to work on a week-long Sprint and know what you’re doing that whole week compared to planning work day-to-day. Time estimations are more accurate and clients are more receptive to the idea of Release cycles. So, the clients have noticed the change? PH: We have a number of clients that are now advocates of Scrum and the Sprint Release cycle since we’ve implemented and educated them on the process. SQ: They like the fact they know at the start of the week what the sprint plan is via Trello and they can see cards moving into completion. SD: Yeah, the clients do seem happier. ML: Ultimately the client wants the best possible outcome for their investment, and if Scrum helps to deliver this, then all the better. Some clients are very engaged in the process and really embrace it; this can be really inspiring for everyone. ML: Personally, I am a huge advocate of Scrum. It is aligned perfectly with the purpose of Blue Wren, to Create Positive Change, and our core values: Progress, Heart, Humility and Together. Scrum will continue to play a fundamental role throughout the life of our business. SD: The team’s input is vital; everyone’s opinion counts. If you keep the team happy, and don’t overload them – they all work at different speeds and levels – the projects stay healthy. SQ: Everyone should live and breathe Scrum. It’s the best thing in the world. 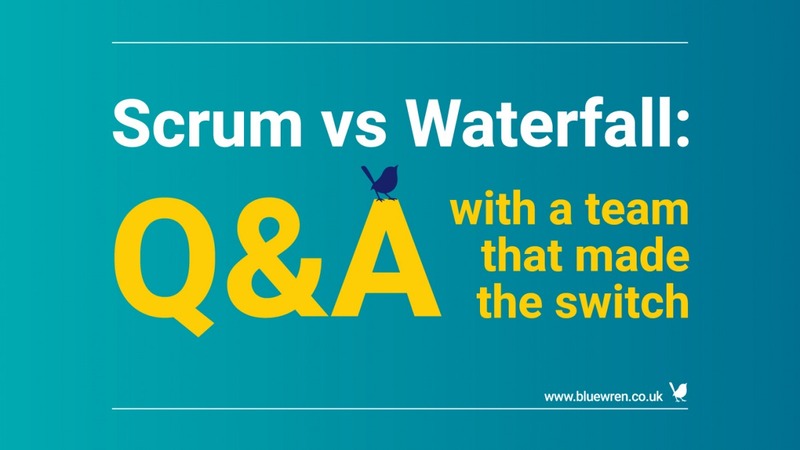 So, while Scrum may have seemed like an uphill struggle at the initial implementation phase, now it is firmly what we strive for and is the backbone of both internal and external processes. 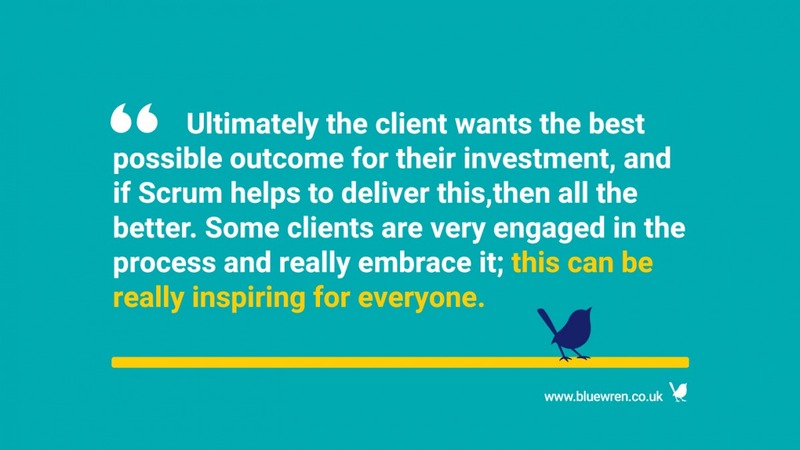 The improvements to communication, collaboration, transparency and productivity are obvious, and it’s a benefit that is felt by not only Blue Wren, but our valued clients. 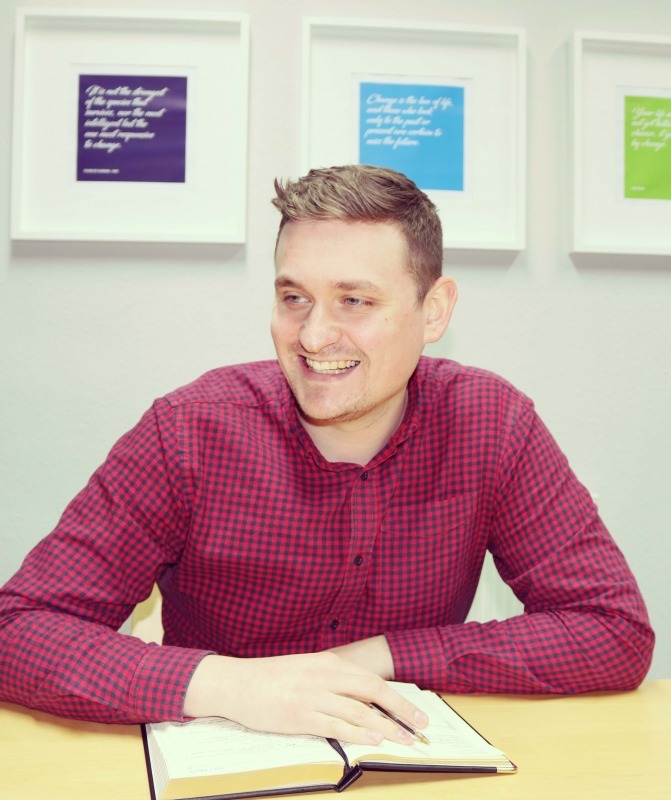 If you would like to take Michael up on his offer, and discuss with him personally about how Scrum can help your company, don’t hesitate to get in touch. It’s never too late to strive for continuous improvement and to help your business realise its potential.